Our home is a Norwegian style dovetail log home with chinking in between the logs, we cut all the dovetail corners on site and set every log ourselves. It has 3 nicely decorated bedrooms all with queen beds and there is also a sofa sleeper with feather-bed, 6 people can sleep comfortably in beds. Each bedroom has its own TV with cable, HBO and DVD/VCR, we also have a DVD library of about 100 movies. One of the three bathrooms is also equipped with a washer and dryer. The kitchen might be considered more of an efficiency one with a smaller 4 top electric stove/oven, full size refrigerator and no dishwasher but is well appointed with all the accessories and utensils you might need. Outside you will find a beautiful sail-shade covered (summer) picnic area along the banks of the river. The picnic area is equipped for cooking on a gas grill or in the fire pit area on the custom made plow disc wok. Really want to relax, you can take a dip in the hot tub surrounded by beautiful flower gardens, and at night enjoy the endless stars. We have made available for our guests 4 inflatable kayaks,a self bailing raft and 4 floating inner-tubes and to use and enjoy during your visit here. You would easily pay over $500 per day for renting these items that are included for free with your stay with us, we are also available to help with vehicle shuttles and and possibly drop offs or pick ups from several different launch areas along the Rio Grande River. New this year we are able to offer guests discounted golfing at the Rio Grande Club. During the shoulder seasons $30. During peak season as low as $39 M-Th, $49 F-Sun. The rental price is based on the the season of the year you are here. We do our best to keep our VRBO calendar up to date (we also list cabins separately on this site). We usually respond within a couple of hours. Riverside Meadows was built entirely by the Owners Fritz and Paula Allen along with their daughter Sadi and we would like to welcome you to out home. This is our primary residence and we will most likely be here for your stay, your private cabin will allow you as much privacy as you like and we will be available to help with any questions and / or problems that inevitably arise. We are located on the banks of the Rio Grande River in a very private and secluded setting on 8 acres. Relax and enjoy the sounds of the river from your cabin, hammock or cooking out right next to the river. You can enjoy fishing from our property or take a float on some of the 17 miles of 'Gold Medal' waters from South Fork to Del Norte. 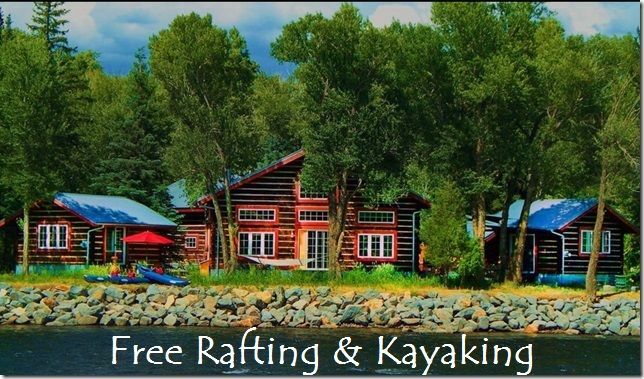 Inflatable fishing raft and inflatable kayaks are available for our guests and if available we are happy to provide a shuttle and possibly act as a tour guide if you are looking for some social interaction. New this year we are able to offer guests discounted golf at the Rio Grande Club. During the shoulder seasons as low as $30 and during peak season as low as $39 including cart rental. We can make a reservation up to 30 days in advance. Winter guests can enjoy use of our snowshoes for free. Take them out and explore our beautiful back country during winter. We will be happy to suggest some areas. Enjoy the outdoor fire pit year round with firewood provided. During the summer we have made available to our guest our 4 inflatable kayaks and a self bailing raft to use and enjoy while here. We recently added 4 high quality inner-tubes for floating as well. You would easily pay $500 per day for renting these items that are included for free, we are also available in the summer to help with vehicle shuttles. You can purchase lift tickets from us for $60 which is 15% off and you can go straight to the lift. Discounted golf at the Rio Grande Club. Shoulder season weekdays $30 weekends $40. Peak Season May 29- Sep 30 7:30-9:00 $59 9:00-12:00 $79 12:00- close $39. All rates include cart rental. We just returned home from our first trip to Colorado. I cannot think of a single bad thing to say about Riverside Meadows. Fritz and Paula are so welcoming and full of knowledge. The cabins, furnishings and property grounds are perfect. Every detail was thought of. It was our family and our friends and their daughter. We rented all three places. We put our teenage kids in the loft apartment with us two couples each getting one of the other cabins. It could not have been more perfect for our group. We hope to return to Riverside Meadows some day. What a delightful spot right on the Rio Grande! A reviewer mentioned that if you could rent all three cabins, do so. We did and absolutely loved our stay. The photos of the site and cabins are accurate. The cabins are spotless and the owners (Fritz and Paula) are some of the most welcoming and helpful that we have encountered in our almost 20 years of renting through VRBO and other sites. Our older grandson was out the door at 5:00 a.m. to fish the Rio Grande with some tutoring by Fritz on how to fly fish, while our younger grandson loved the trampoline and the provided games. Fritz and Paula could not have been more accommodating about taking us to sites to put in the kayaks and with one simple phone call, they were kind enough to meet us at the end of our trip to take out. If you want a great vacation removed from city hustle and bustle that is in a fabulous location, stay here. Thanks for the nice review! We really enjoyed having your family stay with us. Your family was so gracious and polite it makes us love our job! Thank you for choosing us! We hope you will come again! We stayed at Riverside Meadows with our family of 4 along with another family of 4. Each adult couple stayed in one of the smaller cabins, which were very roomy and extremely comfortable and cozy, while all the teenagers stated in the larger cabin with the full kitchen. I absolutely have NOTHING NEGATIVE TO SAY about our stay. Fritz and Paula were very accommodating and helpful with tips on tackling our first experience skiing Wolf Creek. IF you are second guessing staying here because the owners live here too, DONT BE!!! They do their own thing and it's not weird AT ALL! They are very down to earth and relaxed. We all want to come back and most likely will as soon as possible. I want to add that once you pull into the driveway, it looks like a Hallmark Movie Channel Christmas movie. We were sad to leave. Riverside Meadows is an unbelievable place. My husband and I found it to be above and beyond any expectations we had. Fritz , Paula and Sadie are some of the friendliest people we have ever met. The cabins are spotless and beautifully built. The setting is magical. We are so glad Fritz talked us into trying the river kayak. We had a blast! Fritz was beyond accommodating as to put in and pick up. We couldn't have asked for more. We have already booked two more nights for next month and plan to book many more. Thanks Fritz, Paula and Sadie for a wonderful time! We were looking for a Colorado vacation that would accommodate our group of 11. We had such a good time!! Fritz and Paula went above And beyond making our stay from kayaking, rafting, and overall playing fabulous! The cabins couldn't have been nicer. The beds were comfortable, the showers nice. If possible I recommend renting all three cabins, but if you rent one it is so worth the stay!! It was wonderful having Fritz and Paula on the property, they were pleasant to visit with and very sensitive to our privacy as well. When we needed something they were there to acommadate us. Thanks Fritz and Paula for a wonderful vacation we will be back and so will our friends! !